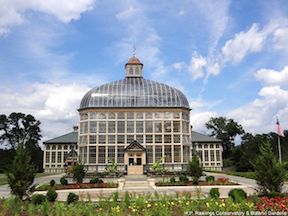 Located inside of Druid Hill Park near the intersection of Gwynns Falls Parkway and McCulloh Street, the historic Howard Peters Rawlings Conservatory & Botanic Gardens is the second-oldest steel framed-and-glass building still in use in the U.S. Opened in 1888, the Conservatory features year-round displays of plant material in five distinct areas of the facility: the original 1888 Palm House, the Orchid Room, Mediterranean House, Tropical House and Desert House. Flowerbeds in the 1½-acre garden provide a kaleidoscope of color from early spring until late fall. In addition, major flower displays are planned during the year, which include the spring Flower Show, fall chrysanthemum and the holiday poinsettia displays. Annual public events include fall and holiday open houses. The Conservatory also hosts a variety of adult workshops, master gardener clinics, children’s nature programs, and the Druid Hill Farmer’s Market from June-September, each Wednesday, 3:30-7:30 p.m. During the market, the Conservatory remains open until 7 p.m. for visitors, programs and events. The Conservatory (and all properties in Druid Hill Park) is on the National Trust for Historic Preservation, the Maryland Historic Trust and the Baltimore City Commission for Historic & Architectural Preservation, making it the perfect venue to rent for weddings, parties, meetings, workshops and other special events. School tours and community groups are welcomed. For more information and rates, visit the Conservatory website. Directions: From the Jones Falls Expressway/I-83 North and South--Take Exit 7/West to Druid Park Lake Drive. At the fifth traffic light (Gwynns Falls Parkway) turn into Druid Hill Park. Make an immediate right after entering the park and the Conservatory will be on your left.